Finally, my favourite contestant won the Swedish final for the Eurovision Song Contest. Can’t remember when that happened last. Obviously, I have to do my part to promote the song, so here goes. Here is her performance in the Swedish final, where I think she sang better than in the qualifying rounds. The powerful bits are less harsh or screamy if you will. Finland have finally done it! 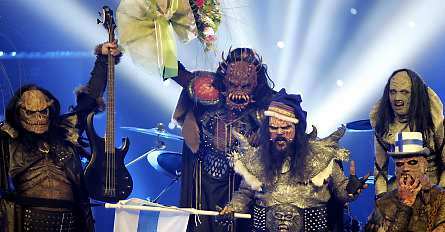 Thanks to hard rock band Lordi, Finland have finally won the Eurovision Song Contest! Those in the know will know (obviously) that Finland have been taking part in the contest for 40 years, but have only acheived a sixth place as their best. BBC cover the story here. My sister has all the results on her website. Posted in Uncategorized | Comments Off on Hard Rock Hallelujah!